Their new message to school choice supporters: Drop dead. Scott Walker and Alberta Darling. 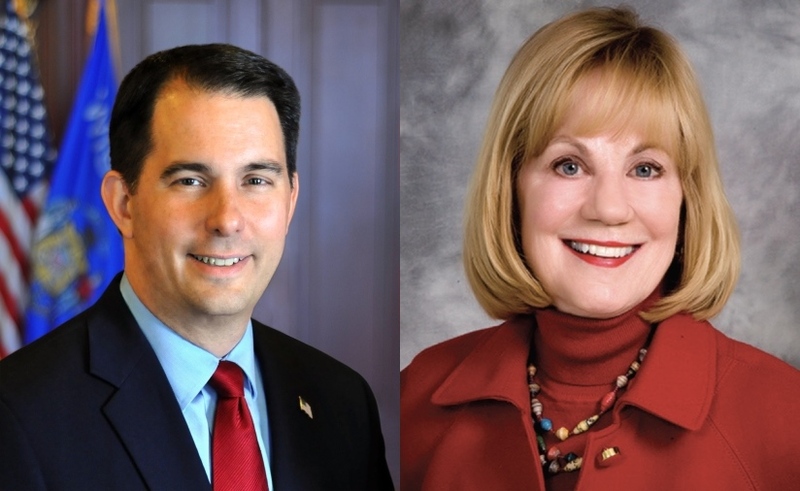 Recalling a famous headline in the New York Daily News more than forty years ago, here’s the message to school choice supporters from Governor Scott Walker and Senator Alberta Darling. One needs to go back a decade, when Democrats controlled state government, to find a time when school choice had fewer champions in the Capitol. In crafting his election year budget, Governor Walker blew off longtime supporters in the school choice community. Figuring their support is “baked in,” he rejected overtures aimed at increasing the number of high quality choice options and giving more choice to working class families. The Governor instead has focused relentlessly on a plan he calls “historic” to provide hundreds of millions in new dollars to K-12 public schools. He has visited dozens of public schools during the year in what amounts to a non-stop series of campaign appearances. When questioned about school choice by some skeptical teachers in LaCrosse, he quickly pointed out that his budget had “nothing” in it for school choice. Now comes Senator Alberta Darling, who yesterday told the Wisconsin State Journal she’s prepared to blow up a compromise on choice eligibility that would make families eligible if their income is at or below 300 per cent of the poverty limit. A 300% threshold would allow working-class families in YOUR communities to access the voucher program…A long-term goal of SCW is to have uniformity between all of Wisconsin’s parental choice programs… [A] consistent income limit across the board is necessary to achieve this. A 300% limit strengthens the school choice movement and helps build the army of school choice supporters who can advocate for positive changes in all the programs. Governor Walker and Senator Darling have been major beneficiaries of support from the local, state, and national school choice movement. The decision to turn their backs on those supporters is quite a disappointment. Gee, it almost sounds like you think the “school choice movement’s” support for these politicians was a quid pro quo, and you’re shaming them for breaching the deal. Maybe I’m misinterpreting. Sorry, George! Looks like Walker took your money and ran! Voucher schools are a joke, investment in public education is much better than giving tax money to profiteering private schools that will let anyone teach. The voucher program is simply an entitlement for middle class families for a government funded religious education in church congregations in whose members choose not to support the schools affiliated with their congregations. I always thought conservatives would consider a religious education a scared obligation of the family and not an activity passed off to the government. If choice is such good public policy, shouldn’t a taxpayer be able to choose from a variety of local vendors providing public services like police, fire, and recreation? The original “sell” for vouchers (in many states) was that they were necessary in certain (urban) districts because public schools there were so bad. This turned out to be a Trojan horse argument, as pointed out by such original voucher backers as John Norquist and the late Polly Williams. Maybe they have not given enough money and this is a wake up call. But then again the whole voucher movement is based upon children not learning how to read. It was and still is the moral basis for the movement. Fuller and company chose to blame MPS teachers and then Public Education itself for their failure (not learning how to read) than figuring out why children do not learn how to read. Hopefully sooner rather that later Urban Milwaukee will publish the following. The current phase of the effort to place the millstone started by their own admission in 1989 in Milwaukee, Wisconsin, with just a few hundred children who were poor and black (other minority children were included but few participated). It was represented to the public that these poor black children did not have the same “advantage” as the white children in Milwaukee, and so the Parental Choice School program* was created by the Wisconsin State Legislature to allow poor minority (black) children to attend a school of their parent’s choice which in essence meant attending a Religious school if it was going to be a better school. All those children already had the right (with just a little luck) to go to any Suburban School through the Court desegregation order. Thousands of children graduated from those Suburban School but no follow up on their success has ever been published. In 2016 the program was killed by Walker and the Republican Legislature almost without comment in the Local Press. This begs the question of WHO should have figured out what was happening and WHO should have directly addressed the MORAL issue of black children (young black male children) not learning. Not only were they not learning but their failures were being ignored as well!! To be fair there surely have been efforts made to address young black males not learning, not graduating and yet as we all know much of that effort have been for naught. * I will leave for others to figure out the exact history of who did or did not make the critical observations that you will see are, in the final analysis, relatively simple and very basic. Please note that Dr. Fuller says he started working with Rep. Polly Williams in 1989 but he does not become the Superintendent of MPS, the largest Public Schools system in Wisconsin, until 1991 and holds that job for 5 years while cutting all of the manual arts classes out of the High Schools and not dealing with black males not graduating. So in the name of black children who were not learning, (the MORAL failure of society) Dr. Howard Fuller began the systematic attack on the Teachers Unions and on Public Education itself. The RIGHT supported Dr. Fuller, and Representative Annette Polly Williams and they became the mechanism to attack the MTEA and MPS. That was a step (the first step?) in the plan to privatize Public Education*. The reading ability of the children between those two schools will also be different but that is an indicating that the problem starts at an earlier age and not in the high school. Yes it starts in first grade and yes it starts in the home before that and gradually builds as the behavioral issues are first squashed and then with age become unmanageable. Even though it may start in the home it still is in Society’s interest to address it ASAP and it is that failure that leads us to where we are today. If it is about the behavior then, where and how can it be addressed? When the teacher has completed the reflection they see their classroom in a way that they may not have seen it before. They will see where their energy goes and also where help is needed. As we know all too often no help is available to help those students who are behaviorally challenged. Understanding Schools that are not succeeding is like learning a NEW computer program. At first it all seems very complex and yet once you have learned the program, it is, hopefully very easy to use but it still will be LOTS of WORK. E) The abuse/trauma can be as simple as a young boy not having a blanket or as horrific as a girl of 11 being raped by her uncle for 2 years and then by her cousin for another 2 years. The boy got his blanket because a teacher took the time to ask him WHY he was so upset and to LISTEN to him. The girl of now 25 was not as lucky, she raged all through high school but NO ONE ASKED WHY! NO ONE LISTENED because they ALL KNEW THAT SHE WAS A SPOILED RICH KID. Wow! If you make 136% of poverty you cannot get help feeding your family. If you make 300% of poverty you get to send your kid to a church school for indoctrination at the taxpayer’s expense, and now rural areas would get do so even at 185% of poverty, Our state government sure has screwed up priorities. Just remembered that Dr Fuller opposed the 300% so who knows maybe Walker and company are making an effort to show the Black Community that they are listening to them. Translation from Mitchell- My benefactors at the Bradley Foundation have given you millions in support for a reason. You aren’t supposed to care about the cost or wreckage that results. And let’s not forget, the families that make $73,000 a year already get a nice write-off of private school tuition due to a prior GOP tax cut. Why are we spending more tax dollars on these people (and taking money away from our public schools) to have them continue to send their kid to the same school? There are significant factors in the cultural-behavioral background of children as they start school in their very first days that are toxic to their and their schoolmates learning potential. Some kids come into the educational environment with some learning already begun and with a respect for authority and adults ingrained. Others come in with almost no educational background and filled with anger ,rage, and yes, violence. My friends who are teachers tell me they fear for the future of this Nation when they see the total lack of discipline and respect that certain students display from the very earliest days of their schooling. These teachers also are often the target of verbal and physical violence from these same students. Attempts to involve the parents( or parent) results in accusations that the teacher is “discriminating” against their child. If tests were administered in the first week of school attendance for first graders, I believe that these deficiencies would stand out like a sore thumb. It is hard to blame the public school system and teachers for the end product when they have had no input at this,the earliest stage of a child’s school attendance. The real villains–poverty,lack of cultural values, and endemic abuse and violence in the home and neighborhood are poor foundations for success in any school system. Bottom line: It is not the teachers or the schools , it is the small percentage of extremely undisciplined and unprepared students who destroy the learning atmosphere in many schools from the earliest days of their attendance. Daniel Golden The good news is the problem as you describe it is solvable. Yes angry children limit themselves and those who share the same classroom but they can be “healed”. You have identified the crux of the problem now to solve it. PS What is your background? Mine is a long story but my wife taught in MPS for 10 years and learned a lot there. School Choice Wisconsin can at least take comfort in knowing that Betsy DeVos, Secretary of (Public) Education, is still in their pocket. “A budget plan proposed by Senate Republicans would increase funding for the state’s three main private school voucher programs by nearly $60 million over the next two years, according to an analysis by the Legislative Fiscal Bureau made public on Tuesday. Thomas – completely agree. But unions and teachers are blamed on a daily basis. More money for counseling, social work and medical help at the elementary levels would help greatly. This is what right wing radio spews all the time. Thomas – Looks like you were able publish a significant amount. If teachers who belonged to a union or not had a voice in the workplace then perhaps there would be more progress. Now, much of the decision making is top down. However, I do think the problem is greater than what teachers and administrators can do. It used to be that students graduating or not from high school in Milwaukee could walk right into a good paying job at a manufacturing plant, Those jobs are long gone. When those jobs left, dreams and visions of a future were lost. Poverty and all its horrific baggage became the norm. The cycle of poverty continues to this day. More money put into counselors, social workers, nurses, doctors that would work in the schools at the preschool / elementary age would go a long way in preventing poverty from taking control of our students. The only people who see this are the one’s who are making comments. You have the right prescription but the trick is to see what specifically what issues in the kids lives that they address. Then it is understandable.